The Divisional Police Station in Okobo area of Akwa Ibom State, and other property worth millions of naira in the locality have been destroyed by angry youths of the All Progressives Congress (APC). They were protesting the alleged imposition of candidate and hijacking of materials by the party officials in connivance with security agents. Sources said the youths that staged the protest walked in major streets of the Oron federal constituency at the weekend condemning the alleged moves by one of the party’s leaders, Senator Godswill Akpabio, to substitute the name of the winner of the federal constituency primaries with his preferred nominee. 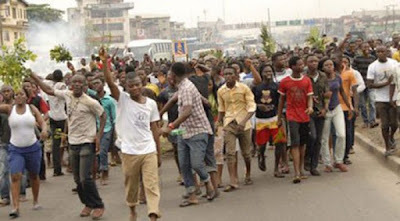 ThisDay reports that the protest that reportedly started at Uya Oro junction was, however, quelled by anti-riot policemen who prevented the rioters from further fomenting more crises. A philanthropist, Robinson Ebumoh, who reportedly won the primaries of the APC had his name missing on the list allegedly approved by the state chapter of the party, which carried the name of former state Commissioner for Culture, Victor Antai. The protesters carried placards with the inscriptions, ‘Akpabio Leave Oro Nation Alone’, among others, as the youths vowed to resist his imposition in the area. Antai, was said to have resigned from the Peoples Democratic Party (PDP) following his inability to pick the Eket senatorial district ticket of the party, and decided to defect with Senator Akpabio to the APC, with the intention of grabbing the senatorial ticket. However, Antai was to have been disqualified from contesting the Senate race to pave the way for Senator Nelson Effiong to get the ticket unopposed for second term. Sources alleged that Akpabio smuggled his name as the candidate for the Oron federal constituency position, despite Antai not picking the form for the race. This development again re-ignited the age-long bickering between Oro people and Senator Akpabio who they accused of neglecting them for eight years when he held sway as governor of the state. The crises was said to have exploded in Okobo LGA, as the APC members stormed the Okopedi divisional station of the Nigeria Police to again register their annoyance over the alleged carting away of electoral materials meant for the House of Assembly primaries in the area. All the APC House of Assembly aspirants from Okobo had gathered at the Police station in anticipation of the arrival of election materials for the primary only to discover that both the materials, the DPO on whose custody the materials were kept and the state party official representing the chapter in the State Working Committee of the party had all disappeared. Reacting to the incident, an APC chieftain from Okobo, who refused to reveal his names, said the violence was just the beginning of more tragedy to come. He said when Akpabio ignited the Warsaw rhetoric, many APC chieftains who should have spoken against it were rejoicing, thinking they have found a new warlord, not knowing the APC is now being hunted by the ghost of those they killed. He said the ghost of those killed in the past elections was beginning to haunt the party. “What is happening today shows clearly that the blood of Chief Ononokpon, Onyong Asukwo, Okon Uwah, Ukpanah, Ime Unamah, Ekpenyong Brothers, Eka Udonwa, Paul Inyang and the rest of the innocent Akwa Ibom people murdered in cold blood by this same party chieftains are hunting them. “This is just the beginning of more anarchy to come. The more reason Akwa Ibom people must be careful with some demons of yesterday parading as saints of today," he said.